Austria’s Semmering Railway is so much part of the country’s history and culture that, for much of the second half of the 20th century, most Austrians carried pictures of not just one of the line’s most famous viaducts, but also of the line’s designer and chief engineer with them wherever they went — sometimes even multiple copies.. 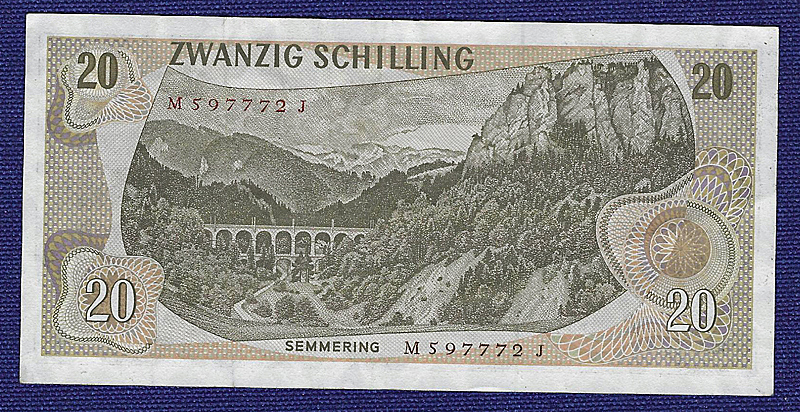 I am talking, of course, of the series 1967 Austrian 20 Schilling bill with a portrait of Carl Ritter von Ghega on the front and the image of the Kalte Rinne Viaduct on the back. 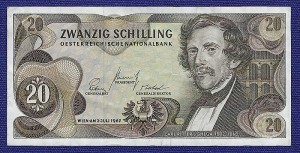 Equivalent to somewhere between one and two dollars, depending on the time of exchange, the 20 Schilling note was Austria’s lowest paper denomination and most widely used paper currency. 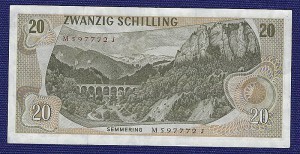 The Semmering 20 Schilling note was in use up into the 1990s, shortly before the changeover to the Euro. The back with a view of the Kalte Rinne (“Cold Ditch”) double-decker viaduct — in a somewhat contemporary view (with catenary masts). Austria, like most European countries, used (and still does with the multi-country Euro) images of musicians, artists, authors — and even civil engineers — on its currency, not political leaders. All denominations below 20 Schillings were in coins. And while there were also 25, 50, and even 100 Schilling coins, these were limited edition commemoratives and usually not in general circulation. Yes, though the 25, 50, and 100 Schilling coins were legal tender, many merchants didn’t like them. But, you could always exchange them at banks. The Semmering line, built between 1848 and 1854 (well before key portions of the U.S. First Transcontinental Railroad) is generally acknowledged as the world’s first standard gauge all-adhesion mountain railway — designed with double track from the beginning. Yes, Ghega was knighted by the Austrian emperor for building a line that many skeptics said could not be built or operated, particularly as it had extensive grades of 2.5 per cent — and mostly on tight curves at that.. Though the actual Semmering line — the steep grades up to and down from the Semmering Pass between Gloggnitz and Mürzzuschlag — is relatively short — only 41 kilometers (or about 25 miles), the line had far greater significance than its size. 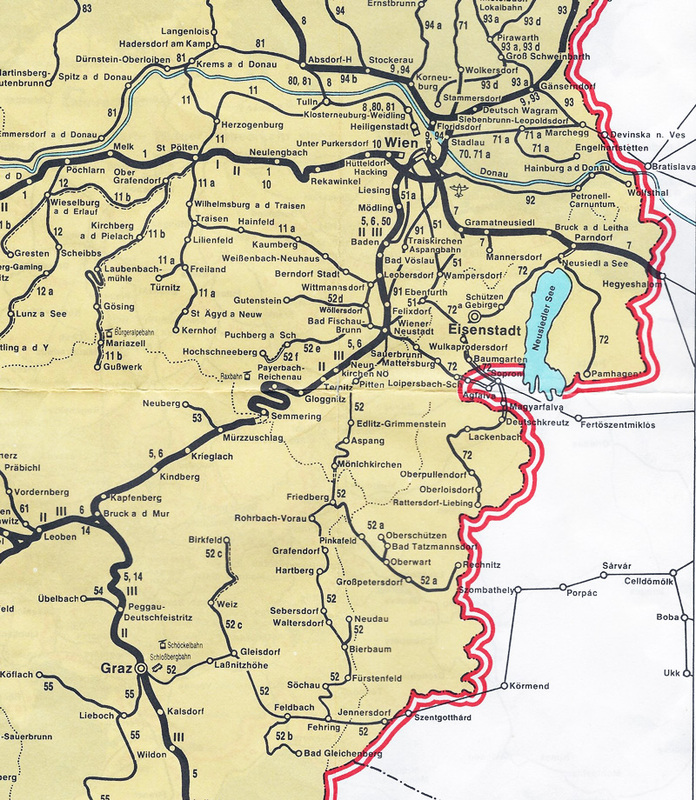 It was a keystone on a route that provided the landlocked seat of the Habsburg Empire in Vienna with a connection to Italy and its seaports. With that rail connection, tropical fruits and other southern goods suddenly became available in Vienna (and much of the rest of Austria) at reasonable costs. The shorter transit time of only a few days also minimized the chance of spoilage en-route. 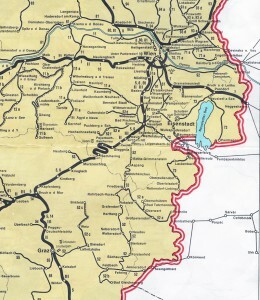 The squiggly line in the center of this excerpt from a mostly schematic 1976 official Austrian railway map (issued with the national timetable book) represents the Semmering line. Of course the squiggles are also mostly symbolic and don’t really show the complex twists and turns used to gain altitude on the line. With its relatively close proximity to Vienna (Wien in German) and the headquarters of the Austrian Railways (in various incarnations over the years), the Semmering line also provided Austria with a built in test track. If motive power and other equipment could operate successfully over the Semmering, it could operate anywhere else in Austria — and probably most of the rest of the world. 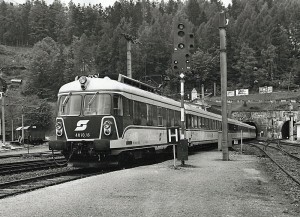 For example, the 5047 diesel railcar (that still operates on some lines today) was tested on the Semmering line pulling two or three standard (unpowered) coaches — a configuration it was never expected to use in normal operation. It was able to perform that task. 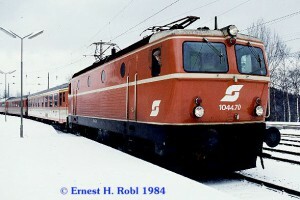 Some Austrian equipment, such as six-axle electric locomotives of the 1010, 1110, and 1020 series, had problems with the tight curves and were generally not permitted to operate on this line. When the line first opened in 1854, new steam locomotives had to be designed to handle the grades and curves. And the continuing existence of the line helped spur other locomotive development over the years — first in steam and later electric. The proximity to Vienna also means that those visiting Vienna with an interest in railroads can easily make a half-day round-trip excursion to the Semmering — and still have time for plenty of activities around Vienna the same day. Vienna’s new main station (replacing the former South Station) is a logical departure point, with most trains getting you to the summit station of Semmering in slightly over an hour.. When I was based in Vienna on trips in the 1970s and 1980s, I always made one or more trips on this line — in all kinds of weather. These included a number of trips on engines when I had a permit for doing so. 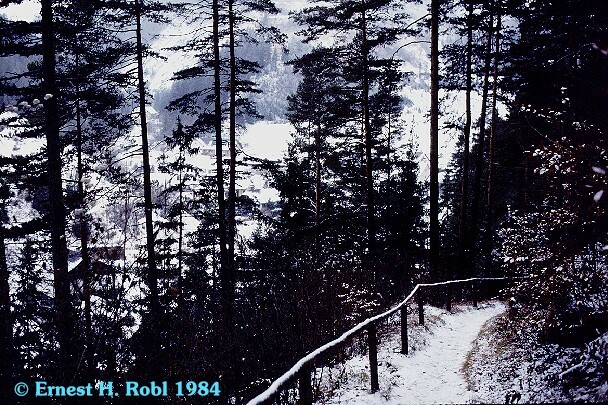 In most cases, I took a fast train to the summit station at Semmering — and then a local a few kilometers back down to Breitenstein. From the station high on a steep hillside, I hiked down a winding and steep footpath (there’s also an even more winding but slightly less steep paved road) into the town of Breitenstein — and from there to one of the views of one of the Semmering viaducts. Even most important international express trains make a brief station stop at Semmering. That may be a bit puzzling at first, as Semmering itself is a relatively small town (though it does have a few tourist hotels). Then the answer becomes clear: The stops are to cut off the helper locomotives added at Gloggnitz. (Helper use is more frequent on the Vienna side of the Semmering pass, where the rail line grade is steeper.) Of course, not all of these trains require helpers — all of the time. During some times of the year and days of the week, these trains may consist of only six or seven coaches, which can be handled by a single modern electric locomotive. But at other times, these same trains can have quite a few more coaches. And, during bad weather, when the rails are wet or icy, helper locomotives are essential. I once rode one of these trains from Vienna to Semmering that had a total of 17 cars, the last several of which were bi-level loaded automobile carriers. 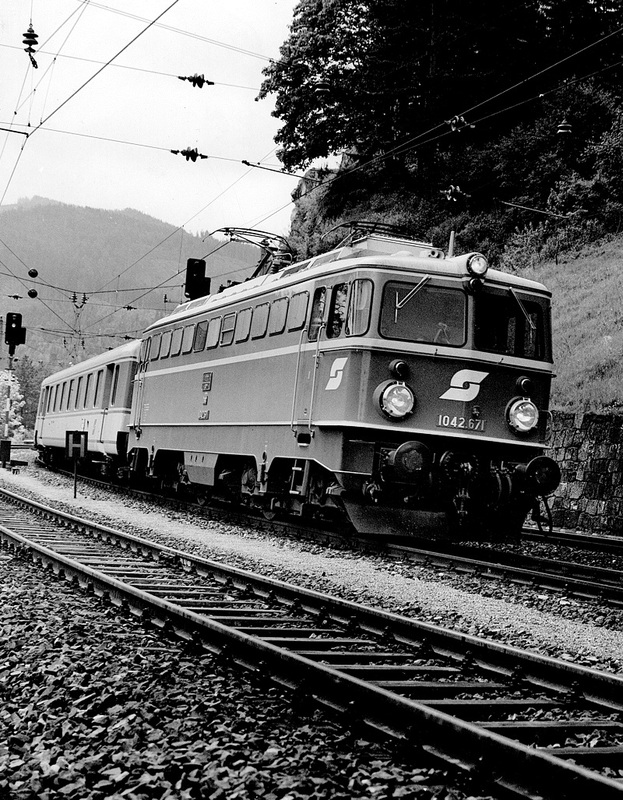 At Gloggnitz, the train received both a front-end and a rear-end helper locomotive for the climb to Semmering. So, to keep the schedule consistent for all days, there’s always a brief station stop at Semmering. These trips produced a variety of images, including one I already included in my previous post on the Austrian 4010 electric railcar sets. But, here, I’ve mostly included older black and white images. One of my favorite photos from the Semmering shows not one of the famed curving viaducts, but rather this 1976 image of a downhill local train leaning into a curve as it enters the station of Breitenstein. A 1042.5 electric leads a short string of Schlieren cars in the Jaffa paint scheme. (This train could easily be replicated in HO with models from Roco.) The train is on the center main track at a point that the double main has just transitioned to three main tracks in the station — see below. From the same trip: A 1042.5 helper locomotive drifts downhill in dynamic braking at the 13-meter long Krausel Tunnel, a well-known feature near the station of Breitenstein. Notice the left-hand running. (Also notice that the two locomotives in the above images have different types of logos on the front.) Helpers are mostly used on the Vienna side of the pass, which has the steepest grades. Most people with some interest in European railroads are aware of the Semmering line, its curving stone viaducts and grades. (The original double track viaducts still stand and carry today’s much heavier trains — thought these viaducts have been reinforced with heavy steel rods and some (mostly invisible) poured concrete. But, few of these people, even if they have traveled the line, are aware of one of its most important features — the Semmering track pattern for its smaller stations. All of these stations, only a few kilometers apart, were originally built with the same schematic pattern — though often actually laid out on curves. The Semmering pattern, using mostly equilateral turnouts. 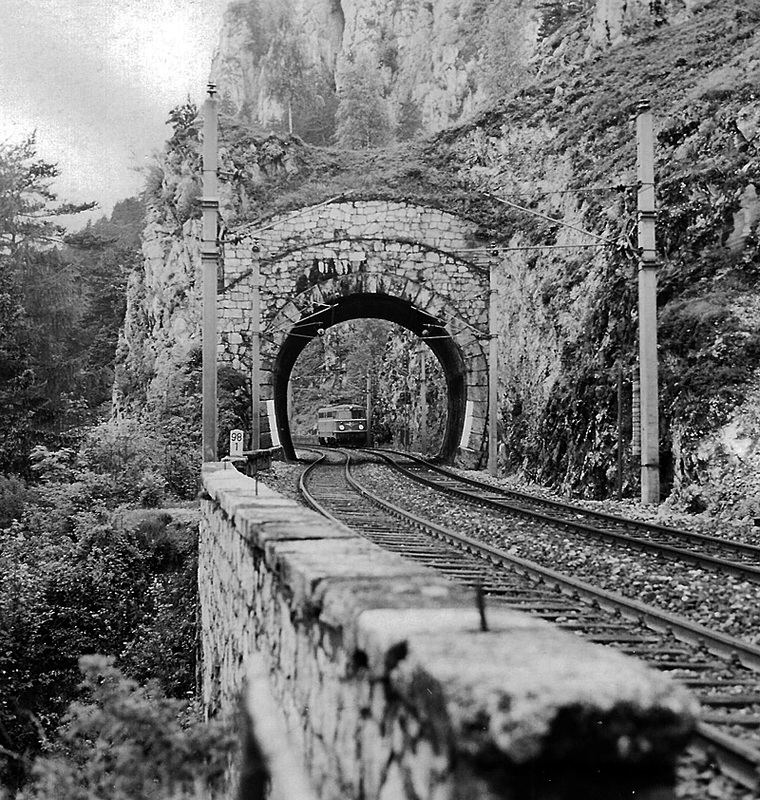 British railroad civil engineers called them Semmering Loops. (In British railroad parlance, “loops” refer to passing sidings, not spiral track configurations.) Though some of these track layouts have been modified over the years, particularly to provide more storage space for maintenance of way equipment, mostly they still exist as originally designed by Ghega. A work train can be temporarily stored in one of the outside tracks, as these have the safety tracks that would keep equipment from running away. Any one of the three station tracks can be taken out of services for track (or catenary) maintenance — without disrupting two-way traffic. This is one Semmering feature that is relatively easy to replicate in a smaller scale. The huge curved viaducts would probably only fit on the largest of club layouts. Keep in mind that not all track systems offer equilateral (“Y”) turnouts. For example Roco Line (with and without roadbed) does not, though Roco’s earlier code 100 track did. But, assuming that this station will already be on a curved segment of track, use of curved turnouts and some flex track will accomplish the same thing. Austrians celebrated the 150th anniversary of the Semmering line with much hoopla in 2004, including a specially decorated electric locomotive. However, in this case, the design of the locomotive was based on a contest held for school children. And, unfortunately, the final design reflected that. Neither the design on the prototype locomotive, nor the model offered by Roco at the time, found much acclaim. The future of the Semmering line is a bit uncertain, as the most spectacular portion of the line is being replaced by a base tunnel, construction on which began in 2012, and which is expected to go into service in 2026. That tunnel (along with other planned track improvements in south-central Austria) will greatly travel times between Vienna and Graz — and Vienna and Klagenfurt. And at the same time, the base tunnel will have a grade of less than one per cent, providing a great savings in motive power and personnel. Even heavy freight trains should be able to traverse that route with a single high-horsepower electric locomotive. However, as the existing line has been designated as a UNESCO World Heritage site, it is expected to continue to offer some type of service in the future. All through freight and passenger service between Gloggnitz and Mürzzuschlag will ultimately be routed through the new base tunnel. While a perfunctory half-day visit will still give you some appreciation of the achievement — particularly for the time of construction — embodied in this rail line, if you have more time, a longer visit with a stay in the area may be worth-while. Once a trendy winter resort area a century ago, the region is now known mostly for vacation houses of Vienna residents who can afford them (and who tend to reach them in their private automobiles). You can find reasonably priced smaller hotels and bed-and-breakfast accommodations,in the region. In fact, these accommodations will be far less pricey than staying in Vienna. As in many of Austria’s mountain regions, most of the stations (still served by commuter trains) are on steep hillsides, with the actual towns down in the valley below. 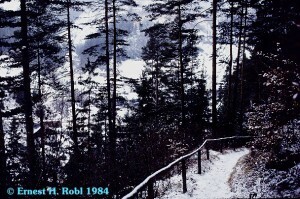 The hiking path from the station at Breitenstein (actually geographically north of the town of Semmering due to the winding nature of the line) to the town of Breitenstein in the valley below — this time in winter. It goes without saying that to really explore this region on foot, solid shoes, preferably hiking boots, are a must. Please note that some of my photos above were made when I had a permit to be on railroad property. However, there are plenty of other photo locations on public property or at or around stations. However, I’ve found that even in officially unstaffed stations employees are still willing to answer questions — as long as you don’t get in the way or interfere with their work. 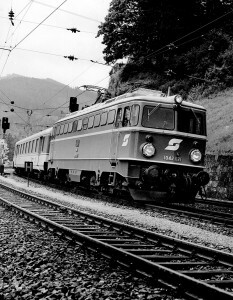 A 4010 electric trainset, with its unoccupied power car pushing, enters one of the twin summit tunnels at Semmering (in the mid 1970s). By 1984, series 1044 (now rebuilt into series 1144) locomotives ruled the Semmering — but heavier trains still needed (and still need) helpers on the Vienna side of the pass. Here a southbound local is making a brief station stop at Semmering, before entering one of the summit tunnels. The German and English versions of Wikipedia have articles on both the Semmering line itself and the new Base tunnel. (The German versions are more detailed.) Those have citations and links to other sources. But, there’s plenty of other literature available about the line. Yes, I’m still planning on at least one more installation of my “Stein am Berg” series. I’ve just been taking a break from that — and working on other projects in the meantime. Always a pleasure to read your well-written, very factual yet conversational pieces — I like the way you meld the prototype with the modeling possibilities.